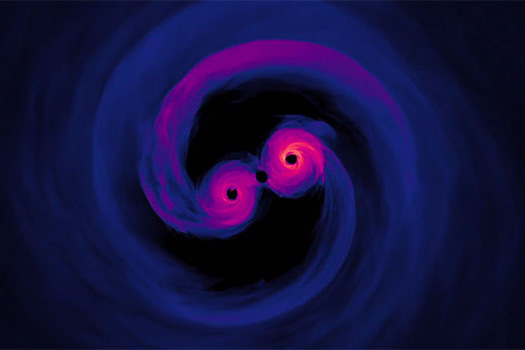 Gas glows brightly in this screengrab of a computer simulation of supermassive black holes only 40 orbits from merging. D’Ascoli worked closely with Campanelli, who had initiated the project nine years ago, and with co-author and former post-doctoral fellow Scott Noble, now at NASA Goddard Space Flight Center. Additional co-authors on the paper include Dennis Bowen and Vassilios Mewes, postdoctoral researchers at RIT; and Julian Krolik from Johns Hopkins University.